Mobile money platform M-Pesa has failed to live up to Vodacom’s expectations for the product in SA, Pieter Uys, the group’s CEO, has admitted. Vodacom has registered “more than” 100 000 M-Pesa users in SA since its launch in August 2010, but says this has fallen short of its expectations for the product. When it unveiled the product last year, Vodacom said it expected to sign up 10m M-Pesa customers within three years — an ambitious target given that SA has a total unbanked population of 13m. M-Pesa was pioneered by Safaricom, Vodacom’s sister company in Kenya, and has been launched in a number of African markets. It’s proved a big success in Kenya and Tanzania, where banking infrastructure is poorly developed. In Tanzania, where the product was launched by Vodacom, M-Pesa has 1,6m active and 7m registered users. By last year, Safaricom had more than 10m M-Pesa users on its books. He says he is “still a strong believer” that M-Pesa will make a “big difference” in SA, and adds that Vodacom is implementing changes to the product in the hope this will help it gain better traction in the market. Uys hasn’t said what those changes will entail. I think if Vodacom really thought this through then they would have gone with a better banking parter – FNB and Capitec would have been a smarter choice. Nedbank service a very different target market and have always been seen as a more affluent bank than the others. Nedbank is certainly not the easiest bank to work with. Pick ‘n Pay’s banking division displayed signs of endless hassles and the product was eventually discontinued. Still this is more filling an artificially created corner of the market and not a necessity. Those 13m unbanked are as a result of FICA and the banks behaving uncompetitively. Come July Vodacom will face the same problems getting its customers registered unless they don’t follow the law to the letter. What we really need is easier and cheaper access to real banking services with debit cards or even the numbered accounts the Swiss has. Interesting. m-pesa generally has a good understanding of payment ecosystems which is why they have succeeded in Kenya and Tanzania. SA is a tougher market so I would not discount them just yet. Perhaps m-pesa should consider implementing Point Of Sale within their mobile wallet offering. This might enable integration into larger scale retail such as supermarkets, gas stations etc… One good example of this mHITs who have pioneered the integration of Point Of Sale with mobile http://www.mhits.com.au. Guys… The bank is incidental, the problem is marketing and focus…. Not enough marketing and no understanding of the market. This product is linked to the unbanked in Kenya and Africa in general…. For SA they should focus on practicality. I’m pretty sure a solution like this won’t fly while it is confined to a single network. I would have more faith if a bank brought this out and ran it over multiple networks. @Ric , spot on, the charges, while comparable or better than MTN Money, were still horrific relative to the amounts transacted. It lends intself to one time withdrawals, not really as an e-purse with multiple (small) transactions. The application process is a complete nightmare…no wonder the uptake is slow. It takes weeks to be approved and requires pages of signed documents. This is not a surprise to anyone. They tried to fit technology to a market, instead of building something the market wants. They target the “un-banked” but want to charge them up to R100 a month in fees (if you work out what it costs a user on the system over a month of using it). Ric said it first and he is right. How is a pensioner on R1000 a month Govt. grant going to manage with a R100 charge just for having a mobile wallet? I’m personally using the product and it is fantastic for those of us who have relatives we need to send money to in the sticks. @ MOPS the product works- we all have read the stories from Kenya and Tanzania. each of these countries even have competing products from other cell networks. SO the IDEA is solid. The marketing and understanding of the market on the other hand is pretty poor. I agree if there is no point of sale integration then spaza shops etc cant commerce on it and therefore isnt an option. In Kenya and Tanzania Mpesa works for all levels of society because of the transaction ability at shops etc. I have seen the Safaricom M-PESA in action. The big difference appears to be the way they avoided a banking partner. I get the impression that this reduced costs substantially. Safaricom did not set out to make a profit out of M-PESA but instead used it as a customer acquisition and retention tool. Moreover – the Kenyan version you have the informal business sector as M-PESA agents – i.e. 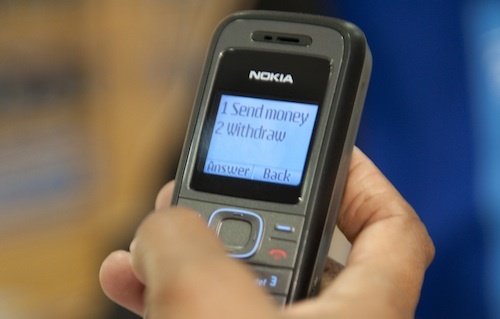 you can transact (prepaid electricity, water, bills) at a guy who sells airtime at a kiosk. FNB’s cardless tranaction tool (ewallet) is being used more widely in SA.